Some people have been concerned regarding missiles that have been shot from Gaza into Israel. These kind of things happen periodically in Israel. 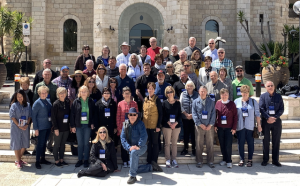 (Our March group in Israel). Israel doesn’t allow it to happen for very long and the vast majority of the missiles land out in the desert without doing any damage. One hit a house with damage and injury. What everyone needs to know, who travels with us on pilgrimages, is that these incidents are far removed from anywhere that we go. We don’t spend time in Tel Aviv or anywhere near Gaza. Our time is all spent far north in Galilee and in Jerusalem. My friends and providers in Israel concur with my assessment. If history is any indicator, this flareup will long be forgotten before we take our next group at the end of May. We have been to Israel over 160 times and have no concerns because we understand the area. We would never take anyone into harm’s way and if we had the least concerned we would cancel a trip rather than take a risk. We took our grandchildren there recently and are planning to take them with us on a pilgrimage again. Janet and I would not do that if we didn’t feel certain of their safety and the safety of all of our pilgrims. Anyone considering a pilgrimage, do not be afraid! Israel is safer than you home town. I have been there five times and have never felt threatened. Don’t let some Hamas actions that cannot reach you, keep you away.